To the Great Staff and Music Instructors at Hollywood Academy of Music. My Daughter begin at Hollywood Academy of Music when she was 5 yrs old, started with the Piano. At six she started at the same school taking an additional class Electric Guitar. At 7 yrs old she added another additional class taking the Pro-Tools Class. At 8 yrs old she is taking three classes all together Piano, Electric Guitar and Pro-Tools. This is something that she wanted to do and picked the classes that she knew that she would be interested in playing and learning. She has accomplish so much at Hollywood Academy of Music in Reading Music, Playing and Recording and making her own CD’s in her Pro-Tools recording class which one of her songs has a patient on it. With the Recitals that Hollywood Academy of Music has twice a year gives each student the opportunity to play in front of an Audience on stage and capture that experience. Attending this Music School also helped my daughter get into the school orchestra where she attends elementary school, and that was learning how to read music. I have referred people to Hollywood Academy of Music and they love the expertise of the music instructors that are teaching their kids. Always remember this, what you get out of the music classes….is what you put into it, and that is practice, practice, practice. All the instructors are professional in their field and music graduate majors, so you know you’re in good hands with the staff at Hollywood Academy of Music. Hollywood Academy of Music has been an amazing experience for our 8 year old daughter. She has been taking classes there since she was 5. Her lessons consist of piano and voice. The instructors are amazing with kids. She was immediately welcomed with enthusiasm from the moment she walked through the door. They really took the time to ask about our daughter and her interests in order to match her up with the right instructors for her. It has been a perfect fit! She looks forward to her lesson every week. They also offer a low key, no pressure chance to perform twice a year. The office is well managed and organized. In the three years we’ve been at the school, they’ve had the same instructors, which gives consistency to the kids and also shows that they treat their employees well. I recommend this school to anyone I know interested in music lessons. I have two boys one thirteen and one nine. They took lessons at Hollywood Music Academy on Melrose Ave. One took piano lessons and the other one electric guitar. After the first lesson I notice that my youngest son was playing small tunes and took it from there to more sophisticated songs .My older son also learned at fast speed. Christine at the front desk is great. She help us more than one time to arrange the schedule to make it possible for my kids to attend. Jay and Dave were my kids instructors and they are GREAT!!! I forgot to mention that the rates are affordable and fit our budget perfectly ! My 9-year old daughter has been taking Voice Lessons at the Hollywood Academy of Music for almost 2 years now and is very happy. 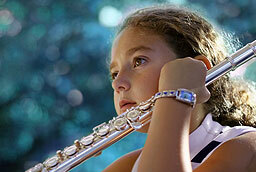 She loves her teacher and has learned alot — harmonizing, ear training and reading music. Gaby keeps it fun and enjoyable while also making sure that she is learning. The staff is also very helpful and friendly. We highly recommend the Hollywood Academy of Music. Great, professional instructors! 3 years ago my daughter took piano lesson (from a different school), and after 4 months, she hated it and i could never gotten her to go to any music studio. Last year i enrolled her for Violin Lesson with Hollywood Academy of Music. I cannot believe it, she loved it since day 1, and now after 1 year, she is still excited to go to music lesson every week. The instructor at North Hollywood Academy of Music is very professional, and dedicated, Miss Lilit taught my daughter the right posture from the beginning. It is amazing to see my daughter loves violin this much. i dont know how Miss Lilit ignites the loves of music in my daughter but all i can say is thank you Miss Lilit, thank you North Hollywood Academy of Music. Friendly, knowledgeable staff. Quick, affordable sign up. Very accommodating to my schedule. Quiet, professional setting. I’m so excited to learn how to play Piano at Hollywood Academy of Music. My son has never been so happy! He started in the group toddler program and graduated to private lessons with Emily whom we absolutely adore! She makes the lessons fun and always updates us on our son’s progress. We are definitely sticking with the Hollywood Academy of Music. Great Teachers and Staff – and a fun place to learn how to play music. I’ve been attending the school for almost 2 years now. Being a corporate guy for my day job, I wanted to branch out and tap into my creative side. I started taking piano lessons 2 years ago and transitioned to guitar 10 months ago. I got a great teacher in Alan, and we now transition between the 2 instruments depending on what I want to do for a specific week. It is what you make of it. If you want structure and want to learn how to read music – they can teach you. I started that way, and then found it more fun to learn how to play specific songs I liked – freestyle. There is nothing better than learning how to play a little Lennon on the piano or jamming some John Mayer on the guitar…. The progress you will make will amaze you….playing an instrument was always on my bucket list of things to do…..now I can play 2 !! My 11 year old daughter started her violin lessons a year ago at the Hollywood Academy of Music in North Hollywood. 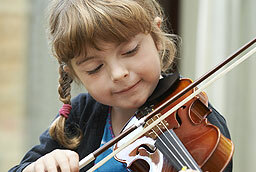 Since day one, she has looked forward to attending her once a week violin lessons with her outstanding teacher, Lilit. My daughter loves her teacher who inspires her and who keeps her focused. I like it very much that she keeps me updated with my daughter’s progress. Everyone here – from Vivian the office manager to the staff – is very professional and easy to communicate with. They have this welcoming environment. My daughter and I are glad that we chose to attend the Hollywood Academy of Music. Hollywood Academy of Music has been a great place for my child to learn piano. He has been taking lessons for almost 3 years. . .since the age of four! The professionalism and consistency of his instructor has provided my son with the ideal atmosphere for learning. Each lesson brings a new week of excitement to learn new songs, piano techniques and music notation. He absolutely loves it and never wants to miss a lesson. Students are given the opportunity to perform at two recitals throughout the year. This is an exciting event for our entire family. It is a fun time for my son and a real confidence booster. 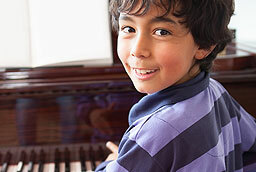 Hollywood Academy of Music has fostered a love of learning and the joy of music in my son. He will continue taking lessons there for quite a while, and I highly recommend Hollywood Academy of Music for anyone interested in learning an instrument. My family and I love this music school. I found them a little over a year ago for my son after months of research, and I chose them for #1: The Quality, #2: Affordability. #3: The Reviews, #4: Their Concern for the Students, #5 Results, #6 Fun & Rewarding. 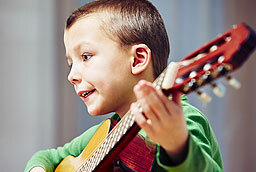 Not only do they offer individual lessons (Guitar, Bass, Piano, Voice etc.) but they also offer such classes as “Rock Band 101” and “Recording” — Plus free recitals every session, and live rock band performances in a no-pressure environment. A REAL Music School for REAL People. Our teacher really works hard to get the basics — breathing, voice placement, letter/vowel sounds, et al — correct before moving on to singing songs. It’s reassuring to do this necessary work before tackling challenging songs, and Melody understands that, in order to sing well and not hurt your voice, a student should master these basic skills first and foremost. Her manner of teaching is professional; communication is good; and she’s a very pleasant person to boot! I love the teachers at Hollywood Academy of Music. My daughter has taken guitar and singing at the school. Both teachers worked really well with guiding her thru the lesson plans and encouraging her talent. Each week she looks forward to taking her classes. I continue to be impressed with the teachers ability to relate and inspire my child. She has really come a long way and has shown great improvement. In addition, the staff has always been friendly and helpful. I highly recommend this school if you want to get your child into music lessons. My 7-year-old daughter took singing lessons with Chris. After the first lesson, she said it was the best day of her life. Chris is amazing–he is very patient, fun, very knowledgable, and knows how to talk to a precocious 7-year-old on her level. It was very easy to schedule private lessons–they are very accommodating. I highly recommend the Hollywood Academy of Music! I almost don’t want to write this review, since I love this place so much, I am scared her teacher will be booked solid. My daughter has been going here for months for her singing lessons. She is also learning to read music, and one day wants to learn to play the piano too. Trifecta!!! Erin, has to be the best teacher ever. She is working with her on her voice, and teaching her little by little how to read music. Come to find out, she also teaches the Piano, SCORE! Since my daughter is only 9, she doesn’t understand the damage she can do to her vocal chords, but thanks to Erin, she is learning. She has her practicing the right way, and doing different things to help her not blow out her voice before she reaches her peak. She has her excited to go every week, and the one week she couldn’t because she was sick, she actually was upset she couldn’t make it. I am thinking within the next year we can move on to the piano as well. This school also teaches guitar, drums, amongst other things. I heard about this place via living social, and I am glad I did. Albert that works at the front desk is always friendly and helpful and will make sure you are taken care of. Thank you Erin and thank you Hollywood Academy of Music, you give my daughter something to strive for, and make her excited to come down to daddy’s house..
Hollywood Academy of Music has been an amazing experience for me. I have been going for 6 years and I go every week for 1 hour with Emily for vocal lessons. She is an amazing teacher, and I love her very much. She is very talented, she has a beautiful voice, and, she has taught some AMAZING things about operatic music to help my career as a singer. She is very concentrated on the music, she is up and energetic. In her absence though, I experienced another music teachers which were very good also. They taught me things like how to breath, my scales, how to control my breath control and how to not waste it in a very short period of time, music theory, and lots more which I cherish very much and am glad that I have learned. I take piano sometimes with a very talented piano teacher, Gabe. He is the best pianist I know. He is amazing! The music he plays makes my heart beg for more! He is very kind, and he has a great personality. He is the best piano in the world to me! He also can play any piece of music you give to him, with only a few days to rehearse it. I was in the need of Gabe at one point. I was singing “Gypsy” from Carmen(Bizet). And I needed a very good pianist to play the melody because it was very challenging. Emily showed Gabe the music and immediately he started playing the music at our first rehearsal together. He did not even miss one note! He was and still is superb!!!!!!!!!!!!!! Also Christine the manager at the main office, she always very nice and VERY helpful! I don’t know what I could’ve done without you Hollywood Academy of Music! We thank you very much Kirk for having this MAGNIFICENT school!!!!! THANK YOU SO MUCH! I have been training at the Hollywood Academy of Music for almost a year now. My concentration is voice training. My instructor, Crystal, is the perfect fit for my training. While focusing on the physiological aspect of singing, she also concentrates on pitch and style. I have come a long way since I’ve started and have gained confidence in my ability. The valley location at 11367 Riverside Dr in North Hollywood, 91602 is convenient for me. This school is top notch. I am not your typical student as I decided to learn the Piano at 44. Albert and Kirk are always at the welcome desk for any questions and guidance. My instructor Alan was really exceptional and for the past 2 1/2 years I have learned a lot. Alan understood that I had a job and this was something I was just doing in my spare time, but he got me to not only play the piano but to read the music and understand it. If you are thinking of learning music I would highly recommend this place. i have been taking guitar lessons for over one year. first with Alan and then with Jay. they have both been great and i am really progressing. Albert, at the front desk, has always been helpful and courteous. Singing was something I was always shy of doing. Hollywood Academy of Music really helped me come out of my shell and show the world what, with some help and guidance, music is all about. I sang here and there never under the wing of a professional voice teacher till I met two who helped me become a better singer. They both had taught me so much about music and about enjoying it every day. I feel more confident with my voice now. I feel like I’ve gotten better. These voice teachers are nice and they have a lot of patience with their students. I’m glad I got to be a student of this academy. My son has been taking drum lessons there for almost two years. His progress has been great. The teacher is very patient, and really motivates him with great assignments. He’s learning to read rhythmic notation as well as how to play. It’s a good balance between theory and play. Hollywood academy of music is a GREAT music school. My teacher Nona is both patient and professional. She gives me the tools I need to play piano. She is always encouraging and makes me feel that I can do it. Thank you Nona! Hollywood Academy of Music and Arts has been an amazing experience for our 8 year old daughter. She has been taking classes there since she was 5. Her lessons consist of piano and voice. The instructors are amazing with kids. She was immediately welcomed with enthusiasm from the moment she walked through the door. They really took the time to ask about our daughter and her interests in order to match her up with the right instructors for her. It has been a perfect fit! She looks forward to her lesson every week. They also offer a low key, no pressure chance to perform twice a year. The office is well managed and organized. In the three years we’ve been at the school, they’ve had the same instructors, which gives consistency to the kids and also shows that they treat their employees well. I recommend this school to anyone I know interested in music lessons.